Fairalon is a delightful fantasy novel that will most likely appeal to preteen girls. The main character, Iris, is unhappy after losing both her mother and grandmother within a two year period. She has been having very strange things happen to her. When she shares these visions with her father, he thinks she is crazy and takes her to see a doctor. Iris ends up finding out that she is very special (not crazy) and her grandmother knew it all along! When her grandmother died, she left all of her possessions to Iris on the condition that Iris moves into her home. In this house many secrets are revealed that explain all the strange happenings and how very special Iris is! I have to start by mentioning the illustrations in this book are quite unique! They appear animated and are super colorful. I only read a digital copy of this book, so they are probably even more stunning on the printed page! The story caught my attention right away. I read almost 100 pages in the first sitting! I enjoyed seeing Iris change from a depressed girl with very low self-esteem to a confident hero! 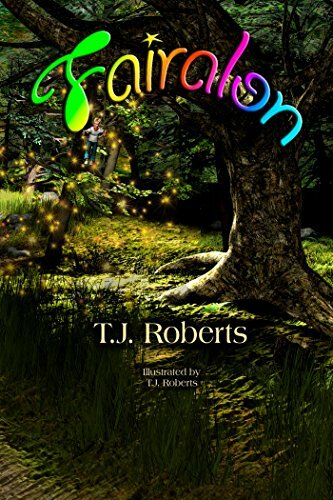 T.J. Roberts did an excellent job building her character and painting a descriptive scene of Fairalon, which is sure to make every reader wish they could visit this magical place! This book is appropriate for any reader age 8 or older.